Longstanding friends worldbeat artist James Asher and drumcircle facilitation trainer and percussionist Arthur Hull meet again to co-create, and produce some of their most persuasive imaginative material within their recorded audio adventures, ranging from energising and percussive to cinematic, chilled and atmospheric. Credits : Recorded by James Asher at Starfield Studios, Eastbourne, East Sussex, England. Produced by James Asher. Music composed by James Asher and Arthur Hull. Published by Radiant Music. Mastered by Gwyn Mathias GBdb. Cover Design by Marc Gannon. 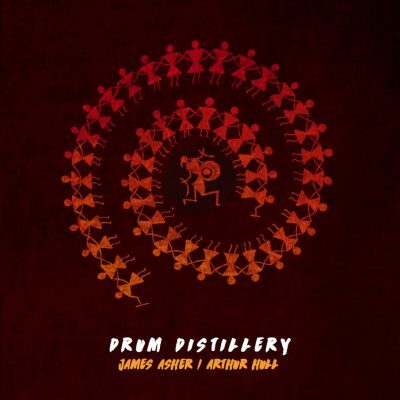 Musicians : James Asher : Keyboards, percussion, drums, Akai MPC X. Arthur Hull : Drums, percussion, bells, vision, fun. Sandeep Raval : Tablas, Humdrum, Ring-Drum, Wicked Ginger Biscuits. Sam McEvoy : Cahon, Batajon, Darabuka, Cymbal swells. Flip Giles : Vocals. Duncan White : Acoustic and electric guitars. Tom Askaroff : Electric Guitar. Phil Kerry : Alto, Tenor and Soprano Saxophones. Bill Eborn : Chromatic Harmonica. Especial thanks to Cecelia Asher for her tireless support, care and joy. Fifteen years ago I developed a fascination with the idea of drumcircles, and set about finding out what I could about their movement. I gathered from initial enquiries this that one of its founder figures was Arthur Hull. This coincided with going to see a demonstration of new Remo drum products in London. It was presented by a curious fellow with a hat, whose ebullient, elf-like and charismatic quality captivated me immediately. This turned out to be Arthur Hull. It was amazing to me learning the broad range and scope of how far drumcircles extend and what a powerful tool for community they are. Arthur’s brilliant playful and engaging way of teaching drumcircle facilitation is unique and compelling. We struck up a friendship, and began exploring ideas in my studio and recording them. Every year in his global touring schedule we would meet for a week or so and explore further journeys into rhythmical alchemy. After three years we had an album, Sounding the Stones, originally released by Dutch label Oreade. From there our adventures rolled on and we explored rhythmic ideas and ambient scenarios, but all with with a light-hearted and playful innocence. Before our get-together in 2017 we had made contact with Adelle Brownlee Brewer from the Nia Technique, who had already discovered that some of our music suited her dance routines well. So during the time we met, Arthur and I were speaking to her about what we were creating, enjoying her friendship and being inspired by her bubbly enthusiasm. It has been a privilege and pleasure to enjoy so many great years of fun, friendship and co-creativity with Arthur, and I am grateful to Adelle for helping to make it an extra special year and album of music. products in London that James got to meet Arthur Hull in 2002. From there a fifteen year old friendship has evolved, and as a result of that some imaginative, original and highly atmospheric music has evolved in a unique and distinctive style. Though the starting point may be drums there is plenty of both melodic elements, a rich palate of musical sounds, and a broad and engaging set of moods and wide set of cultural influences.In Drum Distillery, starting with a trancey almost house style opener, they progress through some instrumentals with an orchestrated cinematic influence, having a progressive and optimistic mood.This music would be ideal for soundtracks and television, but by itself as music brings colourful imagery. Asher is not shy of thinking outside the box, and manages to make the contemporary DJ style of Billy Bravado form a cohesive whole with the Game of Thrones like drama in Deep Valleys. The beguiling voice of Flip Giles sweeps us away on the moody Giving Thanks.During the time of Arthur’s visit to James, Arthur and James were apparently taking part in a jam session at the local pub when they happened upon Flip not only singing, but reducing the pub to a pin-drop as people gasped at the extraordinary quality of her voice. An auspicious and appropriate chance meeting, and opportunity for Flip to contribute to and expand the scope of Drum Distillery. Then we move to serious multiple drum action in Breathdub. This is journeying music of an expansive kind, and the crystal quality of the separation in the recording gives ample room to enjoy fully the differing tones and textures of the hand-drums taking part -djembes, cahon, darabuka, congas, bongos, shakers, woodblocks as well as percussive breath sounds – so never a dull moment! In the next track – Mystic Mambo the influence is Hispanic, and some spirited nylon guitar is at the fore. Another track that particularly grabbed me was Absorbing the Moment. Crisp opening balafon riffs give way to a deep drifting and gently swirling scenario, with a really easy and delightful `Gone Fishing` kind of mood, and above this intriguing soundscape, the melody lopes lazily on chromatic harmonica, evoking a nostalgia for happy childhood memories. We’re back with just drums in Guarana Gazelles and Global Samba, and the multiple layering of the various rhythmic elements with their compulsive grooves deliver toe-tapping fun. Sandeep Raval’s remarkably dextrous finger technique on tablas, humdrum and ringdrum enrich the proceedings. James is clearly drawing here from Arthur’s deep experience of many years of sculpting the orchestrating of the differing sections within his role as drumcircle facilitation trainer. Add to these some chilled and ambient flavoured tracks, and the whole adds up to a most enjoyable musical journey which manages to achieve being energising and relaxing at the same time. For lovers of good music, especially with a leaning to percussion centred music, and/or soundtracks that visually stimulate the imagination, Drum Distillery offers an original and rewarding listening experience. Thank you for your deep and beautiful creation. I am honoured to listen to the diverse and rich sounds that you and Arthur have dreamed and manifest. I love this CD and can imagine that others will too. When shared on the dance floor, I did not need to say anything. The rhythms carried everyone with total ease. It felt effortless for the dancers to be in the groove with you all. I wish that I had a video rolling for you to see. One day. For now, I say BRAVO. Well done. Change nothing. Set it free. I will be so happy to include this music a LOT. Now to some specifics. There is so, so much for me to say. These are a few top observations. I really like the strong drum throughout. Clean. Grounding. Gives the dancer a place to settle and move. Also, the music is very inward, except when it is not. I like that. Certainly Absorbing The Moment has a celebratory vibe as does Mystic Mambo. I appreciate the multiple sources of sound, diverse instruments including the woman’s voice. I would love to hear more of both the masculine and the feminine sounds. Another time! Thematically, this CD rocks too. Global. And Mature. I love the way that you begin quite wild and then soften and eventually spill into such a rich stillness with Infiniterium. Of course, including the rhythms and tempos of many cultures makes this CD contemporary and inviting. Honestly, I love Gurana Gazelles and Billy Bravado.They brought me right into the body. Everyone else too. Thank you for moving through all the chakras, truly. And of course, all the rhythms are in there too, subtle how you weave them. I feel Gabrielle in the music, of course. For now, I bow … in dancing delight. Melissa Michaels, Ed.D.